Easiest way: After you register you will be led through the process to create a Personal Fundraising Page. So just follow those directions, and you can start to fundraise like a pro. Medium effort: If you can’t create your own fundraising page because internet access is an issue, or if you’re just generally internet-averse, we can still help you set one up, so you can refer people there to give. YOU CAN FUNDRAISE BOTH WAYS, online and in person, just keep very good track of any donations NOT made online, keep checks in marked envelopes with donor info on the outside and use pledge sheets to organize your donations for the Foundation’s staff to process easily. 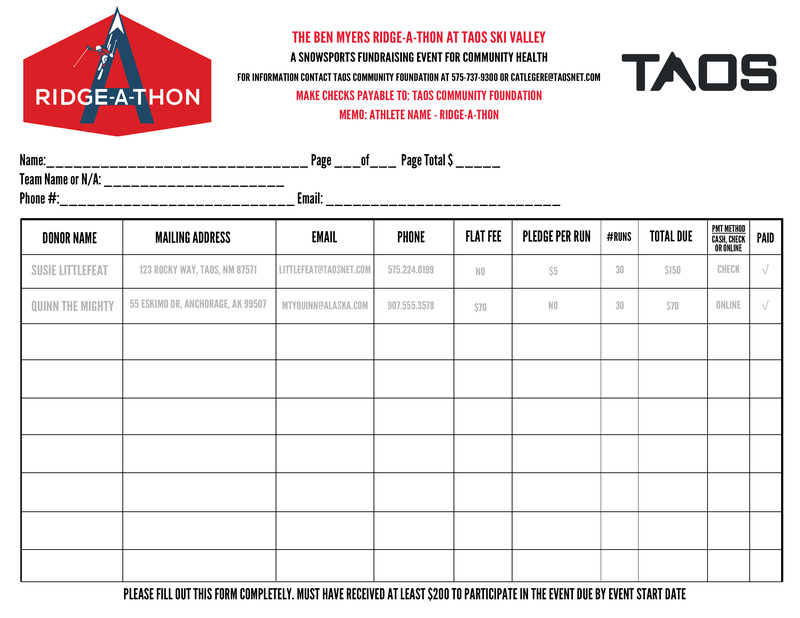 Keep your fundraising page updated with your profile image, bio, your story, including your goals and what inspires you to help improve community health in Taos! Use in-person contacts and email and social media to ask your close circle of friends, family and co-workers to give a flat amount for your participation based on how hard you’re willing to work; if you’re going to try to do 3 hikes, ask for $20-$100 per run. If you’re going to try to do 20, ask for $3-10 per run, or discuss with the donor what total amount they would be comfortable with, and adjust from there. Your average donor can give somewhere between $50-$200. Remind everyone that their donation benefits community health and is tax deductible and that they will receive a notice to use on their taxes. If you’re so inclined, go door to door to individuals and businesses – make sure to take an info sheet with your contact information that you can leave with them if they’re busy or grumpy, you can also try to get a phone number or email to follow up at a better time. Put a jar out at your office if it’s a public place, or ask permission to put one in the office at your school or church. Spare change is still $ toward your donation totals. Easiest way: Ask people to give online directly through your fundraising page and provide them with that link. Medium effort: You can accept flat rate pledges paid at the time of solicitation by check or cash in marked envelopes. Most complicated: If your donor really wants to pledge per run you complete, you will have to follow up with them after the event to facilitate payment, or get them to give money in advance as you promise to do a certain number of runs. AKA – if you believe you will do 10 runs and they pledge $5 per run, collect $50 and promise to complete those runs, then update your fundraising page after the event with your proof of completion so they will know you’ve done what you said you’d do. You can use tools through your fundraising page to contact your donors as well. The more money you have turned in on the day of the event the easier your life (and ours) will be. Collecting after the fact can be difficult if you don’t prepare properly and keep track of cash donations, and obviously that effects the total we will raise. Participants must complete, sign and date the appropriate info sheets and waivers as part of the registration process, either online or in Ridge_A_Thon_Registration_PKT_2019. If completed online, a printed TSV waiver will need to be signed on the day of the event at the time of initial check in/registration. Participants are responsible for their own lift tickets/passes.